The Cat & Bird Quilt and and matching Pillow is finally ready! You will find the pattern and explanation under Free Patterns. The LazyDays Collection is finally here! Inspired by florals from both the Art Nouveau and Art Deco movement with a Tilda twist, the LazyDays Collection is perfect for a sweet yet slightly decadent summer look. Cats as a theme seemed fitting and are accompanied by plump Beach Belles. Check out the LazyDays Catalogue! You can find lovely free LazyDays patterns under FREE PATTERNS. For those of you waiting for the popular Cats & Birds Quilt, we are working on the last details and it will be ready very soon! Create a colourful home-made look with the new Spring 2019 collection AppleButter. This time all the explanations will be released under Free Patterns so you can print and sew anything you see on the pictures. Apple Butter is 1940s slang for sweet talk or flattery, and we think it is the perfect name for this playful and sweet collection with vintage inspired florals. Take a closer look at the designs and our matching basics in the AppleButter catalogue. The collection is inspired by the elaborate dressing room of the designer’s grandmother where all kind of florals from another time collided in a lovely feminine world alongside beautiful perfume bottles and powder puffs. The sweet patterns from the 40s is what stood out with its honest simple charm. The yellow tones are perfect for easter projects. Hopefully spring is just around the corner, enjoy! We have now released the Happy Winter Snowmen Table Decoration under Free Patterns. This table decoration is sewn with Tilda Classic Basic fabrics and matches the Snowmen Quilt and Pillow we released earlier. A single snowman or two are also great decor in a glass bell jar or in a large jar with some fake snow or white glitter. You can of course decorate the snowmen further using whatever you have laying around. I can imagine they would be very cute holding a mini flag garland. Snowmen can be out all winter, but for a more Christmassy theme you can add some mini Christmas gifts. The three in the background is just a branch glued into a small cup, and can be decorated with purls and mini garlands if you prefer. We wish you all a relaxing and creative Christmas! The Happy Winter Snowmen are here! 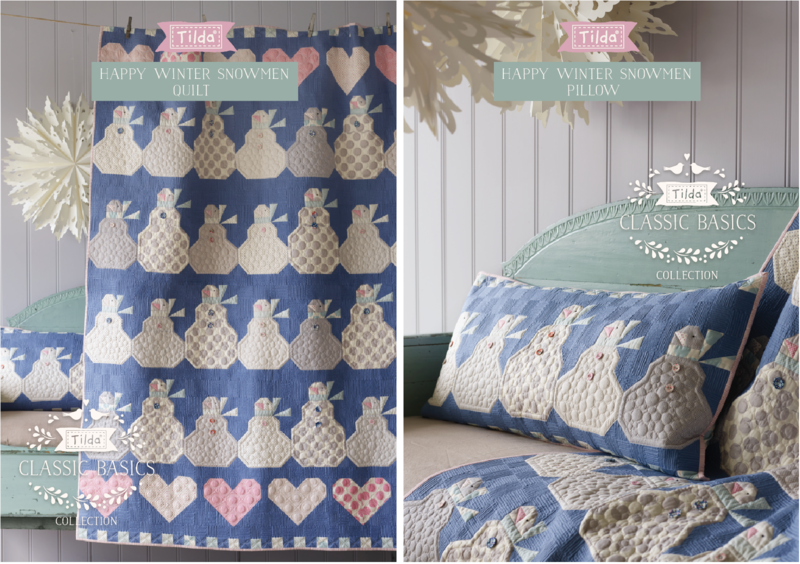 We are very exited to present our new free patterns called “Happy Winter Snowmen quilt and pillow“. 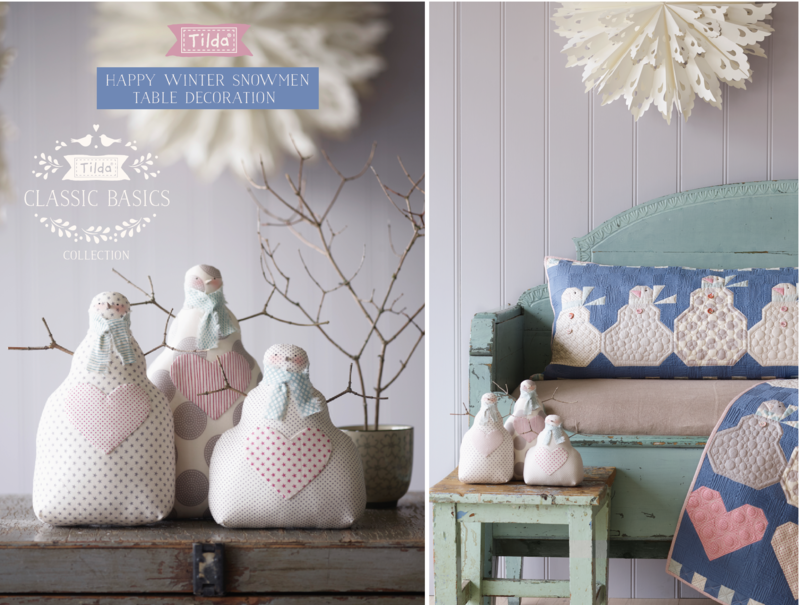 These projects have appealed to every sewing friend we have here at Tilda Fabrics all eagerly awaiting the finished explanations. The projects are sewn with our new basic collection Tilda Classic basics. The quilt and pillow is sewn by Anne Berit Røed Pedersen and quilted by Marianne Nybølet (KarmaQuilt). Explanations and illustrations by Linda Clements. 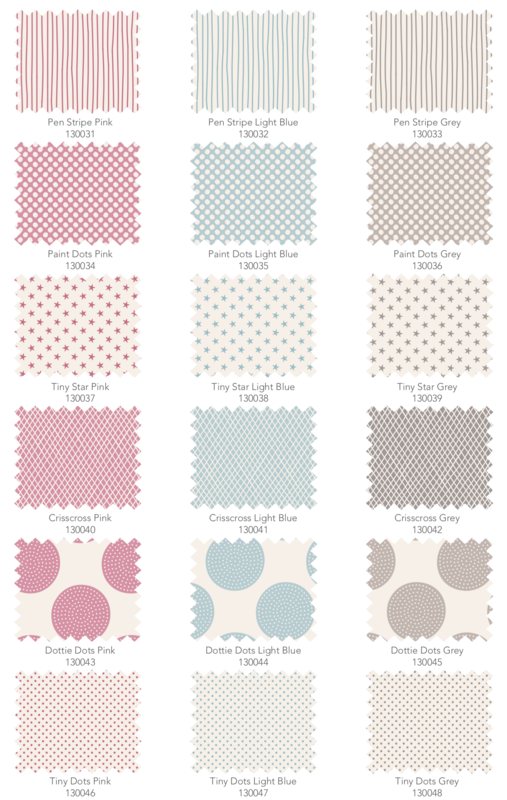 The Classic Basics collection is based on tree of the most popular Tilda fabrics throughout the years – Tiny Stripes, Stars and Dots – slightly redesigned, adding three new patterns to create a lovely soft basic collection with a million uses. The patterns are hand drawn witch gives them charming homemade look. Tilda Classic basics are already out and about in a shop near you or online.